Wireless charging is gaining momentum in the last couple years and is expected to become an increasingly incessant form of charging for a number of applications. The applications for wireless charging are in diverse range of industries such as consumer electronics, automobile, military applications, mobile computing, communication devices, medical devices, and industrial applications. The integration of wireless charging technology into mobile and consumer electronics devices is already taking shape through standardization on a worldwide scale. 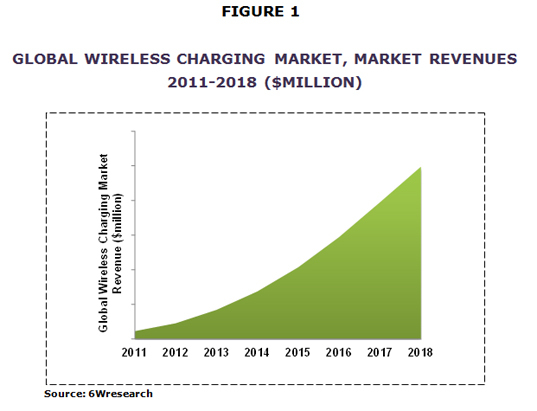 According to 6Wresearch, the Global Wireless Charging market is expected to reach $9,947.4 million by 2018, growing at a CAGR of 42.6% during the period 2013-2018. The report thoroughly covers the wireless charging market by shipments, technologies, applications, and by region. The report provides the unbiased and detailed analysis of the on-going trends, opportunities/high growth areas, market drivers which will help the stakeholders to device and align their market strategies according to the current and future market dynamics. Wireless charging that a7re available in the industry can be categorized as Inductive coupling, Magnetic Resonance, Radio Frequency, Microwave and Optical Beam. Among the technologies listed above, inductive charging is widely used in the industry and is expected to be the dominant technology for wireless charging in the coming years. Of the technologies listed above, inductive, magnetic resonance, and radio frequency technologies are being used today, while the remaining two are almost negligible in terms of usage. According to 6Wresearch, Global wireless charging market generated is expected reach $9,947.4 million by 2018, at a CAGR of 42.6% from 2013-2018.